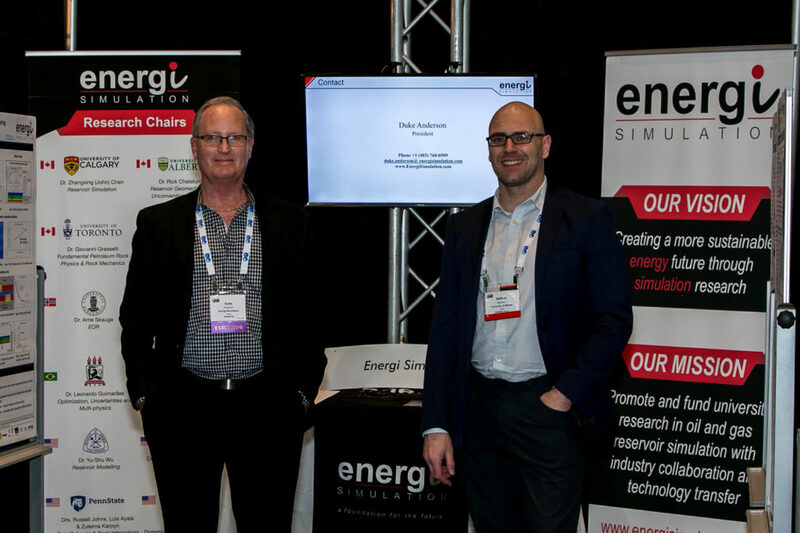 It was great to attend the SPE Canada Unconventional Resources conference last month and be a part of the Energi Simulation booth at the tradeshow. Our research work focused mostly on reservoir geomechanics modeling, that drew a lot of attention from industry and fellow researchers involved in numerical modeling of geomechanical effects on reservoir performance that would impact production and reserves. Over the years, the University of Alberta has been developing many experimental designs and numerical modelling tools to help provide realistic assessment and forecast of geomechanical response of reservoir under various unconventional resource development strategies. Some may have significant environment impact and/or economic implication. The downtimes between conference breaks gave a lot of time for discussions with the other members of Energi Simulation Professors Mackay and Grasselli, as well as Andrew Seto and Duke Anderson regarding research management, computer modeling and what make a successful research program. Additionally, talking with all of the other members of the tradeshow on what they were doing gave a lot of ideas for other engineering activities our Reservoir Geomechanics Research Group at the University of Alberta are pursuing. All in all, a very positive experience and would look forward to attending another tradeshow booth sponsored and run by Energi Simulation.